Southern Star Pecans for Sale > Texas Size Pecan Pralines - One Dozen - $24.95 including shipping. Our Price: $24.95 17% off! The best pecan pralines on the planet! Price includes shipping. 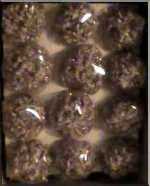 One dozen pecan pralines shipped anywhere in the United States by priority mail. Total cost including shipping is only $24.95 ... a great holiday treat for your someone special! Shipping insurance and/or confirmation tracking is available for an additional fee. Select these options above.